Ajax View enables developer to see and control the behaviors of their web applications on user’s desktops. Adapt an instrumentation policy and serve different instrumentation code over time. For example, we can drill-down into performance problems and gather extra context about bugs. In this lab, you will use an early prototype of Ajax View technology to quickly enable cross-browser performance profiling of web apps, without modifying the original web app code or the client-side browser. First, you will startup Ajax View as a client-side proxy. Then, you will browse a web application while Ajax View monitors its function-level performance, and see the resulting profile information. Research Prototype Warning: Ajax View is an early preview of work we have been doing at Microsoft Research. Our prototype is often rough around the edges, not as fast as it could be, not scalable, etc. First, if you haven’t already, download and install the Ajax View prototype. Start Ajax View by clicking on the Ajax View Proxy icon in your start menu. If you are running Windows Vista, you should see a dialog asking you to allow Ajax View to run with administrator privileges. Click allow. Open either Internet Explorer or Firefox. 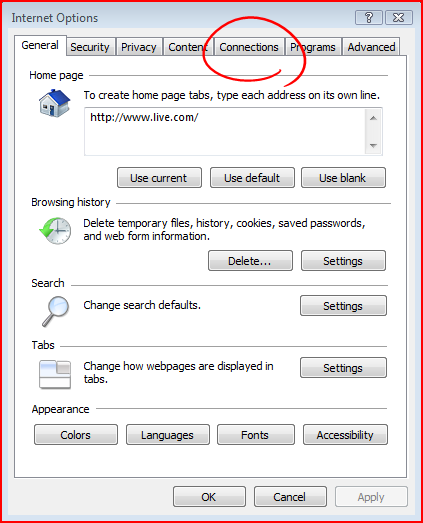 Because Ajax View does not require browser plugins or ActiveX controls, it can profile and monitor app behavior as they run in either Internet Explorer or Firefox. Open the Tools menu, and click on the Internet Options menu item. 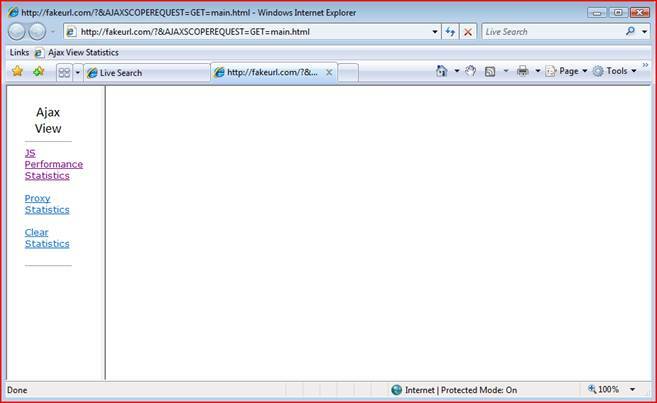 Click on the Connections tab in the Internet Options dialog box. 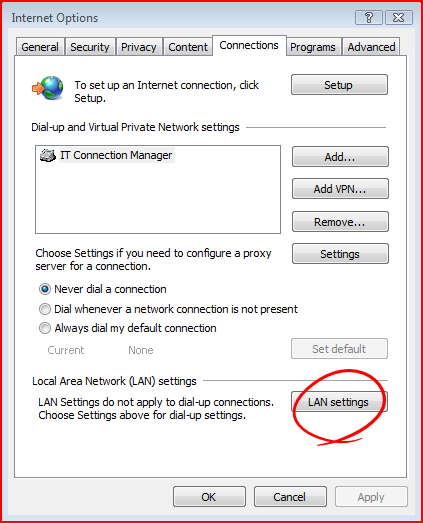 Click on the LAN Settings button in the Connections pane. 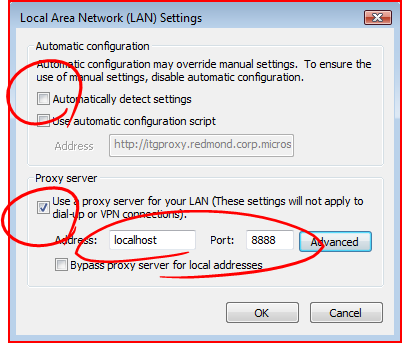 Check “Use proxy server for your LAN” and ensure that the address is set to localhost and the port is set to 8888. Note: The Ajax View proxy does not support HTTPS / SSL connections. If you want to browse HTTPS sites while Ajax View is enabled, click through to the Advanced settings, uncheck the option to “use the same proxy server for all protocols,” and enter Ajax View only for the HTTP protocol. 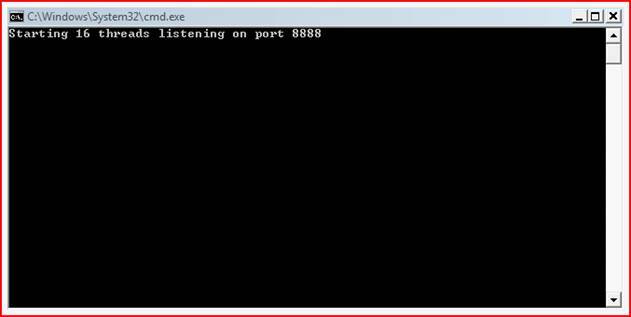 Leave the Secure, FTP and SOCKS protocol proxies blank or set to your previous proxy. Once the page has loaded, search for hotels in las vegas by typing “hotels” in the top search box, and “las vegas, nv” in the address box. Double-click a few times in the middle of the map to zoom into the center of Las Vegas. 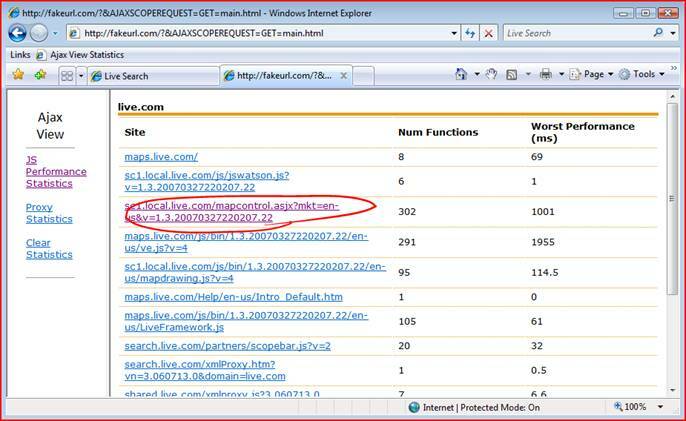 While you use maps.live.com, Ajax View is monitoring and capturing the applications behavior. Now, it’s time to look at the information that Ajax View has gathered. Press CTRL+T to open a new tab. This URL will be intercepted by the Ajax View proxy. 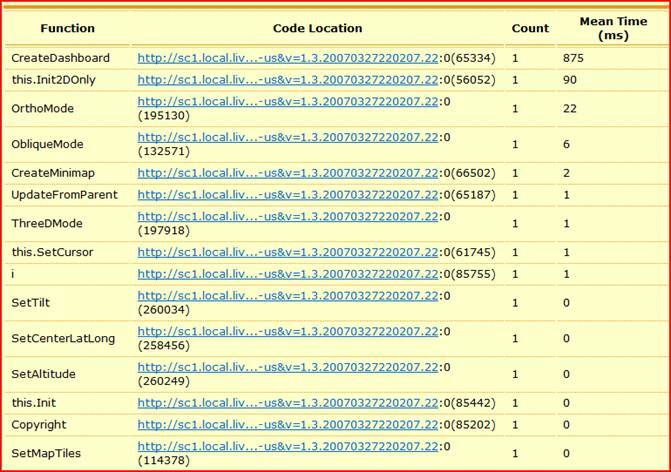 Instead of sending this request to “fakeurl.com”, Ajax View will return its own statistics page. Click the “JS Performance Statistics” link. Let’s see what the slowest functions were. Click on the “Mean Time (ms)” column to sort the table by this column. 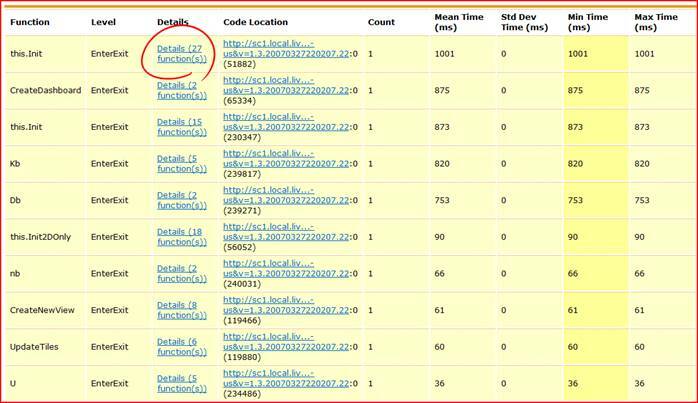 Let’s get more detail about the performance profile of double-clicking to zoom in on the map. Click on the “Details” link next to the “this.Init” function. Now, we see a list of the functions that are called by the “this.Init” function, sorted by their average performance. Now, try it with your own web application! Just browse to the site and then return to the Ajax View main page to see the statistics. Our prototype actually does a little more rewriting than is shown here. 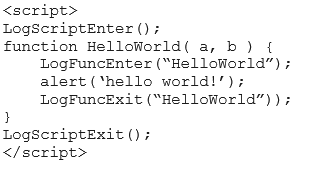 For example, it inlines the logging functions to reduce performance overhead, rewrites return statements, and keeps track of the line number and character offset of the function to help identify anonymous functions and disambiguate functions with the same name. Whenever the injected instrumentation logs an event, such as a function enter or exit, the event is timestamped and added to a queue. A timer event handler periodically empties the queue of messages and reports them back to the proxy via an HTTP post request. The proxy is responsible for analyzing the results and generating the per-function performance statistics. You have used the Ajax View proxy to gather performance profile information for a web application, without modifying the original web application, and without installing any extra plugins, ActiveX controls or extensions in the web browser. 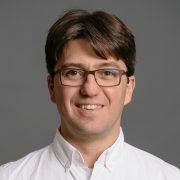 As Ajax View is currently an early research prototype, we are considering several future directions for the project, including further research into instrumentation policies to help developers debug their application, and the possibilities of integrating this technology into developer tools and/or web server infrastructure.